Has student previously been in Foster Care? I give permission for him/her to receive in-school tutorials as needed. Has student ever attended Barbers Hill Schools before? Please give two names (relative, neighbor, friend) in the event that parent/guardian cannot be reached. 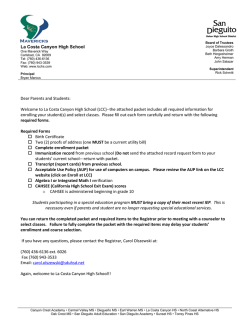 guardian, I hereby authorize the school to make whatever arrangements deemed necessary for the health and well-being of the student. health status of your child. person liable for tuition or other costs as provided below. per student as maintenance and operating expense, whichever is greater. Barbers Hill Independent School District will enforce these codes to the fullest extent. I have read the preceding Education Code statements and fully understand the consequences of falsification of documentation. 1. 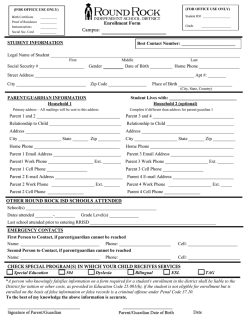 Place the original copy of the Required Student Survey, completed upon registration, in the student’s permanent folder. 2. Call and send a copy of the Required Student Survey to the ESL/LEP Coordinator when an answer other than English is given to question 1 or 2.
use observer identification as a last resort for collecting the data for federal reporting. South America (including Central America), and who maintains a tribal affiliation or community attachment. This space reserved for Local school observer – upon entering data in student software system, file form in student’s permanent folder. appropriate school staff in order to have a better understanding of the health status of your child. Parents are responsible for notifying the school nurse with your child’s specific health conditions. Is your child currently under any type of medical care? *If yes, are they taking medication at home or school? Is there anything special you wish to bring to our attention? on the faculty of each school. Please feel free to consult her about the health of your child. parent or guardian of each student attending the District disclose the student’s food allergies. be disclosed to the District in order to enable the District to take necessary precautions for your child’s safety. introduced by inhalation, ingestion, or skin contact that requires immediate medical attention. My child does not have any food allergies. Please sign at bottom of page. My child has a food allergy(ies). 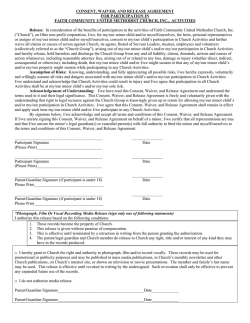 Please complete the form and sign below. My child has a severe food allergy(ies)* as defined above. 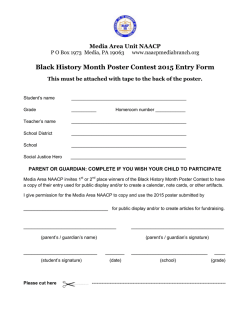 Please complete the form and sign below. FD(LEGAL) and FL(LEGAL) – Food Allergy Information. District’s Policy FO (LOCAL) STUDENT DISCIPLINE: Corporal Punishment. who may qualify for Migrant Program services that provide additional academic support. 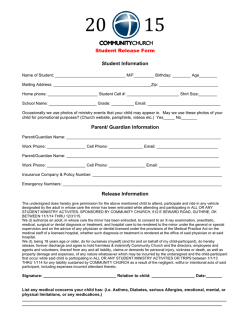 Please answer the following questions and return this form to your child’s school. 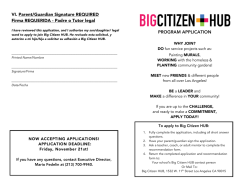 processing, harvesting, cultivation of crops, food processing, dairy work, forestry, fishing, etc? If you answered “yes” to question # 2, please complete the information below. Also list names and ages of children who are not enrolled in school. I understand that my computer use is not private and that the District will monitor my activity on the computer system. violation of these provisions may result in suspension or revocation of system access. I do not give permission for my child to participate in the District’s electronic communications system. limitation, the type of damage identified in the District’s policy and administrative regulations. I have access to the Internet and will read the Barbers Hill ISD Acceptable Use Guidelines-for the Internet. I prefer a hard copy of the Barbers Hill ISD Acceptable Use Guidelines-for the Internet. As noted in the student handbook, state and federal laws provide for public access to student directory information. 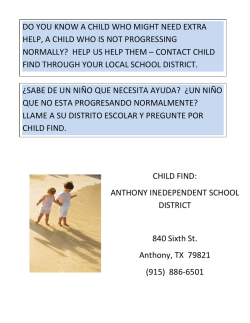 I am requesting that my child’s school take one of the following actions regarding the release of school directory information. release ANY information about my child, including name, photograph, grade level, and most recent school attended. 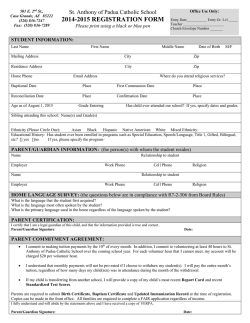  DO, if requested, release information about my child, including name, photograph, grade level, and most recent school attended. newsletters, brochures, internal and external publications, television media and posting on the Barbers Hill ISD website. This release is given without the promise or expectation of compensation. and enrollment of the child under false documents subjects the person to liability for tuition or other costs. TEC Sec. 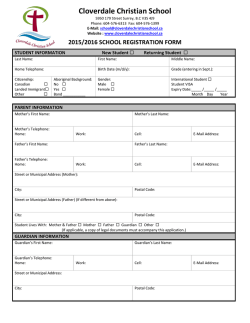 If you checked Box 1, this Student Residency form is complete for registration. where the student is now living. Thank you. FOR OFFICE USE ONLY - If the answer to questions 2-8 is checked, forward original to Director of Auxiliary Services. I certify the above named student qualifies for the Child Nutrition Program under the provisions of the McKinney-Vento Act or Foster Care. students in carrying out their responsibilities. Both publications described above are available on the Barbers Hill ISD website for each school. (http://www.bhisd.net/page.cfm?p=546) Select school and publications. I prefer a hard copy of the Barbers Hill I.S.D. District Code of Conduct and Student Handbook. signatures below confirm that you have received or have access to each. transition process of changing schools when their military parents are reassigned and forced to relocate. No, please do not release my child’s mailing address. sibling, please fill out acknowledgement below. permission to the following sibling(s) to accompany my child off the school bus for the 2015-16 school year. será utilizada para planificar el desarrollo de su hijo/a. ¿En cuántas casas a vivido su hijo/a? Which of these words best describes your child? In what ways is your child unique? ¿Cuál de estos mejor describe a su niño? What are your child’s favorite play activities and interests? Does your child have any speech difficulties?